One of the biggest changes we’ve been working on for the past few weeks is the physics system. Flixel used a standard AABB system, meaning every object has a simple bounding rectangle that is used for all collision. 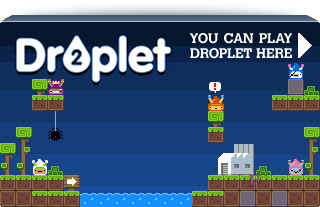 You can resize it, but you can’t rotate it (even though the sprites themselves could rotate). Hit detection, mouse events, motion and separation were all calculated against this box. There are pros and cons to this approach. On the plus side it’s extremely fast. The math required is very basic, so ideal for low-powered devices like mobile browsers. Flixel employed a basic single pass separation system. It worked great but exhibited strange side effects when the quantity of objects or velocities started increasing. For a good percentage of games it’s enough, but the biggest downside is that for anything a bit more interesting you were left to your own devices to implement it yourself. Also input collision using just AABB isn’t very useful – irregular shaped or rotated objects were registering touch/pointer events even though you were far away from the graphic itself. We needed to find a solution for this. 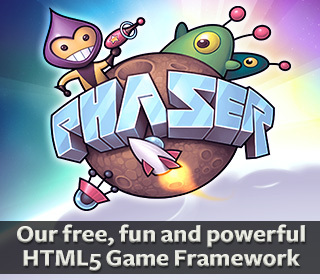 We didn’t want something as extensive as Chipmunk, but it had to be much better than the simple bounding boxes offered in Phaser 0.95 and Flixel. We also wanted it converted to TypeScript so we had full control over it. In the end we opted for a custom physics system. Based heavily on the excellent work of Ju Hyung Lee we took his original code and with his permission adapted it to our needs. The result is a powerful physics system that’s still easy to implement and use. Including native shapes (Box, Circle, Triangle, Polygon, Segments), full Joint support (welded joints, distance joints, revolute joints, wheels, prismatic, angle joints, rope and input based joints), a solid Contact Solver and Collision system and Contact responses. It’s the perfect midpoint we needed: fast, pretty well optimised (although there is always room for improvement!) and most importantly it’s featured enough that you can create really interesting and dynamic games using it. It added very little overhead to the file size as well, coming in at just 45KB (gzipped, non-minified). The stage we’re at right now is deciding how tightly this should be tied in to the core of Phaser. It’s actually 100% stand-alone at the moment, so we’ve two approaches to consider: We can keep the current Flixel AABB style physics system and make the new advanced one optional. Or we could ditch the old and replace with the new. For some games simple AABB is more than enough, but for a lot it isn’t – and you can’t mix and match them, it’s an “either or” situation. We’re not opposed to bundling both systems in 1.0 and letting the developer decide, but it may be easier to just stick with the new one. I can think of pros and cons for both choices. Feel free to post your thoughts in the comments section below. Especially if you find the AABB physics of the current build too limiting for the sorts of games you want to make. The six million dollar question! We’ve a massive BBC game that ships on July 11th across mobile and tablet devices. This is an extensive game; a large central map system leads you through 19 unique puzzles, from action based mazes to lock breaking and matching. Think of as being like the Professor Layton games. It’s a bold move for the BBC actually, as it’s one of the more ‘cerebral’ games they’ve ever commissioned, relying on brainpower rather than dexterity. We need to ship this game before we can think about making 1.0 public. Right now the end of July is looking hopeful. Of course all the work we’re doing is available right now on the 097 branch, but it’s highly experimental in places so you venture in there at your own risk. It has been an exciting time building Phaser. Releasing it early and seeing people use it was a massive boost for us to carry on developing it. Playing games made in it is such a great feeling, and being able to use it for our own projects is just the icing on the cake. We’ve got a fantastic new site design to go with the launch and honestly we cannot wait until we get 1.0 into the stable master branch. For now please follow development on our forum or leave feedback in the comments. Posted on June 25th 2013 at 6:35 pm by Rich. 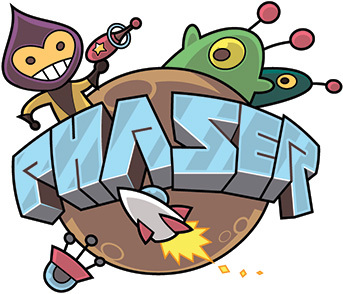 I haven’t tried my hands on Phaser yet, thus from a “begginner’s” point of view I vote for the best documented engine to stay on the core. Be that documentation either actual documents/tutorial or source code/examples. But also, if I try my experienced-programmer’s hat I cast my vote on the most versatile engine, given that the most talked-about advantage of HTML5 is the platform-agnosticism (did I get it right?). So if the new engine is easy and simple as you say, and performs well on mobile, then I would go for it. I’m amazed by your commitment to enriching the community. Thank you Rich! This sounds great (aside from waiting until the end of July for 1.0)! The new custom physics engine also sounds very impressive. As far as including it in 1.0, why not have it as an optional module, like phaser-fx? Advanced physics of any sort will be overkill for many games, but it’s nice to have it when you need it. 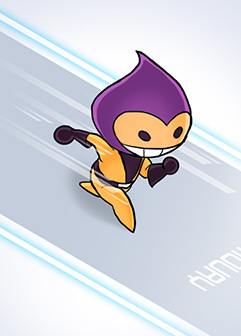 Hi, Im very interested in mobile browser games, since I’m trying to get into it too. I did some mobile project but discovered the performance varies a lot on android devices and we had a hard time to get the game scaled right. I’m curious which devices do you support (or not)? Do you leave elements on bad performing devices? Hey Rich. Did you ever consider using the 2d physics engine available in the Turbulenz library. It was written from scratch in JS and is pretty efficient?